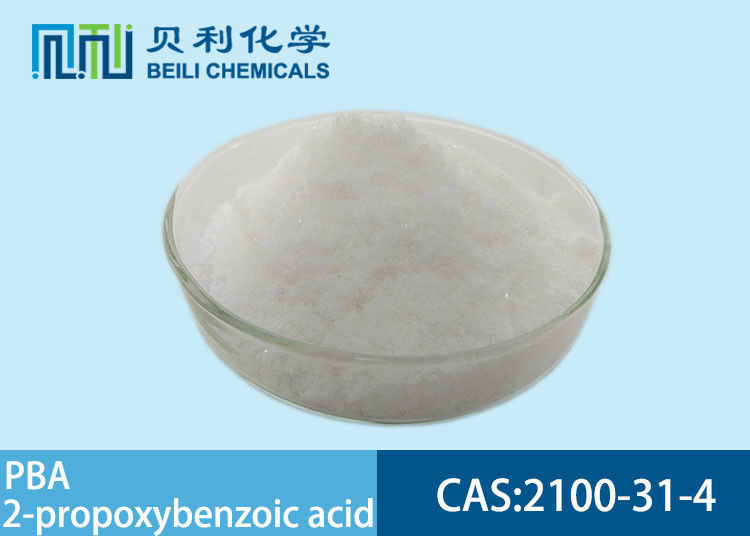 The Benzoic acid,2-propoxy-, with the CAS registry number 2100-31-4, is also known as 2-n-Propoxybenzoic acid. It belongs to the product categories of Aromatic Carboxylic Acids, Amides, Anilides, Anhydrides & Salts; Organic acids; Acids & Esters; Anisoles, Alkyloxy Compounds & Phenylacetates. This chemical's molecular formula is C10H12O3 and molecular weight is 180.2. Its IUPAC name is called 2-propoxybenzoate. This chemical can be used for pharmaceutical intermediates and used in organic synthesis. What's more, you should keep the storage areas to avoid contact with oxidants, the container sealed, stored inside a sealed storage, a cool, dry place. 2-Propoxybenzoic Acid is a salicylic acid derivative used in the preparation of inhibitors of tyrosinase or hyaluronidase. 2-Propoxybenzoic Acid is a very potent inhibitior of collagen-induced aggrega tion of human platelets. Used as pharmaceutical intermediate, and also take part in many organic syntheses. Store in a cool, dry place, avoid direct sunlight. Store in a tightly closed container. BeiLi is a professional manufacturer of PBA Benzoic acid,2-propoxy- CAS 2100-31-4 in China. 5) At the same time, the company has a branch in Shanghai. Shanghai, is one of the world's largest port, convenient for the customes provide logistics services. Storage condition: Store in a tightly closed container.